Good digestive health is the foundation of a healthy body. Digestive problems can lead to allergies, arthritis, autoimmune disease, rashes, acne, chronic fatigue, mood disorders, dementia, cancer... and more. Having a healthy gut is about much more than eliminating gas and heartburn, it's about total health. 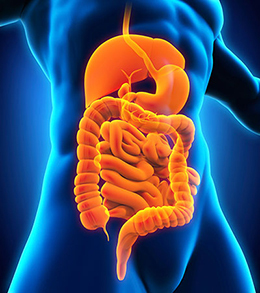 Your digestive tract is connected to every cell in your body. Every day we feed our bodies foods and encounter toxins that make the digestive system's job very difficult, and that impacts your overall health. What this means in practical terms is that digestive health problems are your body's way of telling you something is wrong. Symptoms are gas, bloating, or not having daily bowel movements. Or it could be more severe-you get ill after eating certain foods, you have low energy or exhaustion, you break out in hives, you have eczema, or you have migraine headaches. You don't have to live that way, the good news is that by getting to the root causes of your GI dysfunction and coming up with a holistic plan to address them, you can feel better. For many people, healing digestive problems is more complicated than just eating a healthy diet. As a board certified Functional Medicine practitioner, Debbie Reynolds, nurse practitioner, frequently starts by assessing gut health. She helps people all over the country get to the root cause of GI dysfunction and reclaim their digestive health. You may need to be tested for celiac disease, gluten sensitivity, Candida overgrowth, H pylori, parasites, food sensitivities and other possible issues. Then she works together with the patient to develop a plan that will help reclaim your health. Reduce stress levels-Stress can contribute to symptoms such as cramping, bloating, constipation and diarrhea (irritable bowel syndrome). You can help control your stress levels by engaging in regular physical movement, meditating, yoga and breathing techniques. Stop smoking and other bad habits. It is widely known that smoking can contribute to a variety of health issues, including digestive problems. Smoking cigarettes may increase the likelihood of acid reflux and can lead stomach ulcers and heartburn. In addition, excessive liquor and caffeine consumption can lead to digestive health problems.